One Chinese man decided to surprise his girlfriend in a very unusual way. He had sent her a bouquet made of banknotes. The unnamed man from the Chinese province of Jilin has sent his girlfriend a bouquet made of banknotes of the total amount of 10,000 yuans, which is slightly more than 1,450 USD. 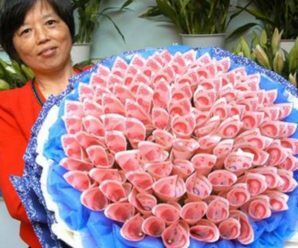 Each banknote has been in the form of roses, and the bouquet was made by florist in Changchun.